Dozers (tracklaying crawlers or wheel tractors equipped with a blade) are perhaps the most basic and versatile items of equipment in the construction industry. Dozers are designed to provide high drawbar pull and traction effort. They are the standard equipment for land clearing, dozing, and assisting in scraper loading. They can be equipped with rearmounted winches or rippers. Crawler tractors exert low ground-bearing pressure, which adds to their versatility. For long moves between projects or within a project, transport dozers on heavy trailers. Moving them under their own power, even at slow speeds, increases track wear and shortens the machine’s operational life. A crawler dozer consists of a power plant (typically a diesel engine) mounted on an undercarriage, which rides on tracks. The tracks extend the full length of the dozer. While there are several sizes of dozers employed in mining operation, from light units that are multi-purpose backhoes with small blades used for cleaning ditches, and plowing sand and snow to extremely large units weighing over 200,000 pounds. Small mines and general work deals mostly with the medium class includes dozers having an operating weight of 15,000 to 45,000 pounds (Figure 2-1). A dozer blade consists of a moldboard with replaceable cutting edges and side bits. Either the push arms and tilt cylinders or a C-frame are used to connect the blade to the tractor. Blades vary in size and design based on specific work applications. The hardened-steel cutting edges and side bits are bolted on because they receive most of the abrasion and wear out rapidly. This allows for easy replacement. Machine designs allow either edge of the blade to be raised or lowered in the vertical plane of the blade (tilt). The top of the blade can be pitched forward or backward varying the angle of attack of the cutting edge (pitch). Blades mounted on a C-frame can be turned from the direction of travel (angling). These features are not applicable to all blades, but any two of these features may be incorporated in a single mount. STRAIGHT BLADE Use straight blades for pushing material and cutting ditches. This blade is mounted in a fixed position, perpendicular to the line of travel. It can be tilted and pitched either forward or backward within a 10° arc. Tilting the blade allows concentration of dozer driving power on a limited length of the blade. Pitching the blade provides increased penetration for cutting or less penetration for back dragging. ANGLE BLADE Angle blades, which are 1 to 2 feet wider than straight blades, are used most effectively to side cast material when backfilling or when making sidehill cuts. Use an angle blade for rough grading, spreading piles, or windrowing material. It can be angled up to a maximum of 25° left or right of perpendicular to the dozer or used as a straight blade. When angled, the blade can be tilted but it cannot be pitched. SPECIAL-PURPOSE BLADE There are special blades (Figure 2-2), such as the Rome K/G, designed for clearing brush and trees but not for earthmoving. The Rome K/G blade is permanently fixed at an angle. On one end of the blade is a stinger. This stinger consists of a vertical splitter and stiffener and a triangular-shaped horizontal part called the web. One side of the triangular web abuts the bottom of the vertical splitter, and the other side abuts the cutting edge of the blade. The abutting sides of the web are each about 2 feet in length, depending on how far the stinger protrudes from the blade. This blade is designed to cut down brush and trees at, or a few inches above, ground level rather than uprooting them. When cutting a large-diameter tree, first use the stinger to split the tree to weaken it; then, cut the tree off and push it over with the blade. Keep both the stinger and the cutting edge sharp. The operator must be well-trained to be efficient in this operation. There are other special-purpose blades not discussed in this manual which can be mounted on dozers. Clearing vegetation and trees is usually necessary before moving and shaping the ground. Clearing includes removing surface boulders and other materials embedded in the ground and then disposing of the cleared material. Ensure that environmental-protection considerations are addressed before conducting clearing operations. Specifications may allow shearing of the vegetation and trees at ground level, or it may be necessary to grub (removing stumps and roots from below the ground). Project specifications will dictate the proper clearing techniques. Plan clearing operations to allow disposal of debris in one handling. It is best to travel in one direction when clearing. Changing direction tends to skin and scrape the trees instead of uprooting them or allowing a clean cut. Clearing techniques vary with the type of vegetation being cleared, the ground’s soil type, and the soil’s moisture condition. Table 2-1 shows average clearing rates for normal area-clearing jobs. Increase the Table 1 values by 60 percent if the project requires strip type clearing (common in tactical land clearing). Engineers perform tactical land clearing as a combat support function intended to enhance and complement mobility, firepower, surveillance, and target acquisition. NOTE: These clearing rates are average for tree counts of 50 trees per acre. Adverse conditions (slopes, rocks, soft ground) can reduce these rates significantly. Moving the dozer, with the blade slightly below ground level, will usually remove small trees and brush. The blade cuts, breaks off, or uproots most of the tree and bends the rest for removal on the return trip. A medium tractor with a dozer blade can clear and pile about 0.25 acres of brush or small trees per hour. To remove a medium-size tree (7 to 12 inches in diameter), raise the blade as high as possible to gain added leverage and then push the tree over slowly. As the tree starts to fall, back the dozer quickly to avoid the rising roots. Then lower the blade and drive the dozer forward, lifting out the roots. The average time for a medium tractor with a dozer blade to clear and pile medium trees is 2 to 9 minutes per tree. Step 1. Start on the side opposite the proposed direction of fall, and make a cut deep enough to sever some of the large roots. Make the cut like a V-ditch, tilted downward laterally toward the roots. Step 2. Cut side two. Step 3. Cut side three. Step 4. Build an earth ramp on the same side as the original cut to obtain greater pushing leverage. Then push the tree over and, as the tree starts to fall, reverse the dozer quickly to avoid the rising root mass. After felling the tree, fill the stump hole so that it will not collect water. The average time for a medium tractor with a dozer blade to clear and pile large trees is 5 to 20 minutes per tree. The time required to clear and pile massive trees requiring this four-step procedure will often be more than 20 minutes each. NOTE: The roots on the fourth side may also need to be cut. Mount a rake on the dozer in place of the blade to remove roots and small stumps. As the dozer moves forward, it forces the teeth of the rake below the ground’s surface. The teeth will catch the belowground roots and the surface brush left from the felling operation, while the soil remains or passes through. Never operate clearing tractors too close together. Do not follow a tree too closely when pushing it, because when it begins to fall, its stump and roots may catch under the front of the dozer. Clean out accumulated debris in the dozer’s belly pan often to prevent fires in the engine compartment. The two methods for estimating production for clearing and grubbing projects are the quick method and the tree-count method. Table 1, shows quick estimates for normal area clearing. Use the quick method only when a detailed reconnaissance and a tree count are not possible. Step 1. Determine the size of the area to clear (in acres). Step 2. Determine the size and number of dozers available. Step 3. Determine the maximum size of the trees to clear. Step 4. 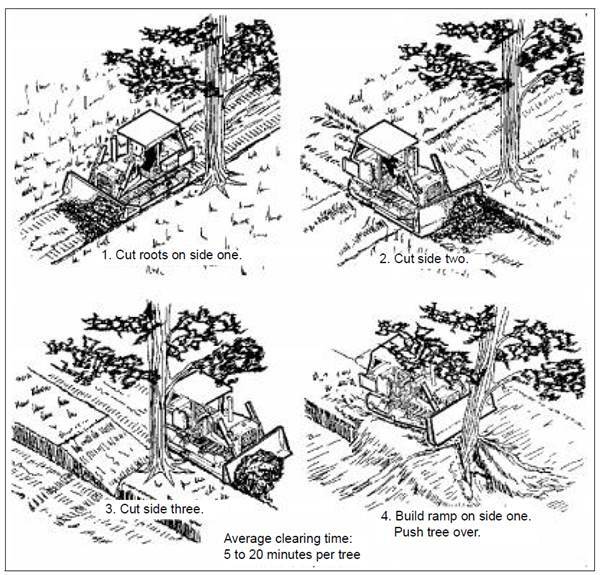 Determine the time required (hours per acre) for clearing, based on dozer size and tree size (see Table 2-1). Step 5. Determine the operator factor using Table 2-2. Step 6. Determine the total time (in hours) required to complete the mission. Determine the time required to clear an area that is 500-feet wide by 0.5 mile long. Two medium bulldozers are available for the task. The largest trees in the area are 14 inches in diameter, and the ground is fairly level. The operators are of average ability and will do all work during daylight hours. Expected efficiency is 50 minutes per hour. Use this method when a detailed reconnaissance and a tree count are possible. The tree-count method allows for a better production estimate. Step 1. Determine the size of the area to clear (in acres). Refer to step 1 of the quick method. Step 3. Determine the average number of each size of tree per acre. This will require a field reconnaissance. Step 4. Determine the basic production factors (hours per acre) based on the dozer size and the size of the trees to clear (Table 2-3). NOTE: These times are based on working on reasonably level ground with good footing and an average mix of soft and hardwoods. Step 5. Determine the time required to clear one acre. time per acre by 25 percent. NOTE: The tree-count method has no correction factor for efficiency or operator skill. The values in Table 3 are based on normal efficiency and average operator skill. One of a dozer’s more important uses is making sidehill cuts, which includes pioneering road cuts along hillsides. An angle blade is preferred for this operation because of its side-casting ability. It is best to start the cut at the top of the hill, creating a bench several dozer lengths long. Do this by working up and down the slope perpendicular to the long direction of the project (Figure 2-4 A). Design the benches to ensure that water runs off without damaging the slope. If possible, start the bench on the uphill extreme of the cut (the highest point of the cut) and then widen and deepen the cut until the desired road profile is achieved. Be sure to start the bench far enough up the slope to allow room for both the inner slope and the roadway. Because the perpendicular passes are short, the dozer usually is not able to develop a full blade load. Therefore, after constructing the initial bench, turn the dozer and work in the long direction of the project (Figure 2-4 B). Develop a full blade load and then turn the dozer to push the material over the side. After developing the bench, use either a dozer or a scraper to complete the cut. Keep the inside (hillside) of the roadway lower than the outside. This allows the dozer to work effectively on the edge and decreases the erosion of the outer slope. Make sure to maintain the proper slope on the inside of the cut. It is very difficult to change the cut slope after construction. Maintain the proper bench slope by moving out from the inside slope on each successive cut. Determine the slope ratio from the distance moved away from the slope for each successive cut and the depth of each cut. When cutting the road’s cross slope, work from the toe of the bench to the road’s outside edge. There are two methods for finishing a side slope—working perpendicular to the slope and working diagonally up the slope. The dozer shown in Figure 2-5 is finishing a side slope by working perpendicular to the slope. Start the dozer at the top of the embankment and, on each pass, earth will fall to the lower side of the blade forming a windrow. On succeeding passes, pick up this windrow and use it to fill holes and other irregularities in the terrain. Be careful to prevent the blade corner from digging in too deep; this would steepen the slope beyond job specifications. the bottom and working diagonally up the slope. The windrow that forms is continually pushed to one side, which tends to fill low spots, holes, and irregularities. This is one of the few instances where a dozer works effectively pushing uphill. Dozers work best when the ground is firm and without potholes, sharp ridges, or rocks. Uneven surfaces make it difficult to keep the blade in contact with the ground. This tends to bury vegetation in hollows rather than remove it. To save time and increase output, use the following techniques when conditions permit. When straight dozing, if the blade digs in and the rear of the machine rises, raise the blade to continue an even cut. If moving a heavy load causes the travel speed to drop, shift to a lower gear and/or raise the blade slightly. When finishing or leveling, a full blade handles easier than a partially-loaded blade. Side-by-side dozing will increase production 15 to 25 percent when moving material 50 to 300 feet (Figure 2-7). When the distance is less than 50 feet, the extra time needed to maneuver and position the dozers will offset the increased production. 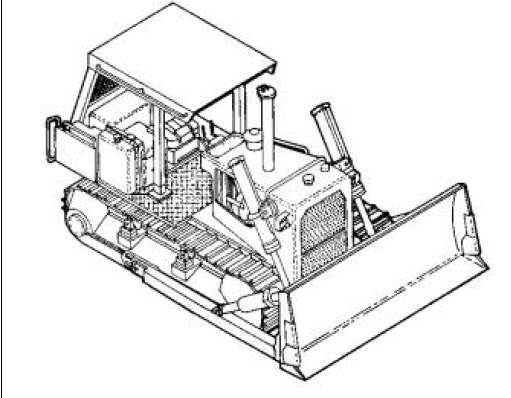 Slot dozing uses spillage from the first few passes to build a windrow on each side of a dozer’s path (Figure 2-8). This forms a trench, preventing bladeside spillage on subsequent passes. To increase production, align cuts parallel, leaving a narrow uncut section between slots. Then, remove the uncut section by normal dozing. When grade and soil conditions are favorable, slot dozing can increase output by as much as 20 percent. Pile several loads at the brink of the hill, and then push them to the bottom in one pass. When dozing downhill, travel to the bottom of the hill with each load. Use downhill dozing whenever possible since it increases production. Use the dozer blade to loosen hard material when rippers are not available. Tilt the blade to force one corner into the material. Tilting is done through blade control, by driving one track onto a ridge of material bladed up for this purpose or by placing a rock or log under the track. To maximize the driving force of the blade, hook only the tilted end under the material. Break a thin layer by turning on it with a dozer. Turning causes the track grousers (cleats) to break through the top layer. With a thin layer of frozen material, it is best to break through at one point. By lifting and pushing, the blade breaks through the top frozen layer as shown in Figure 2-9. Use a rake to remove small rocks. The rake lets the soil remain, or pass through, while digging the rocks from the earth. When removing large, partially buried boulders, tilt the dozer blade and dig the earth out from around three sides of the boulder. Lower the blade enough to get under the fourth side. Lift the blade as the dozer moves forward to create a lifting, rolling action of the boulder. If the dozer cannot push the boulder, lift it upward with the blade and have someone place a log or some other object under the boulder so the dozer can get another hold. The rolling action removes the boulder as the dozer moves forward. Dozer work in rocky areas increases track wear. If possible, install rock shoes or rock pads to cut down on this wear. Wet material is difficult to move with a dozer. Also, the wet ground may be too soft to support the weight of the dozer. If so, make each successive pass the full depth of the wet material. This will place the dozer on a firmer footing. If available, use wider tracked shoes for better flotation. When working in mud, push the mud back far enough that it will not flow back into the cut. Make provisions for recovery operations in case the dozer becomes stuck. Try to use machines equipped with a winch. Shallow ditches are best accomplished using a grader, but dozers can accomplish rough ditching. 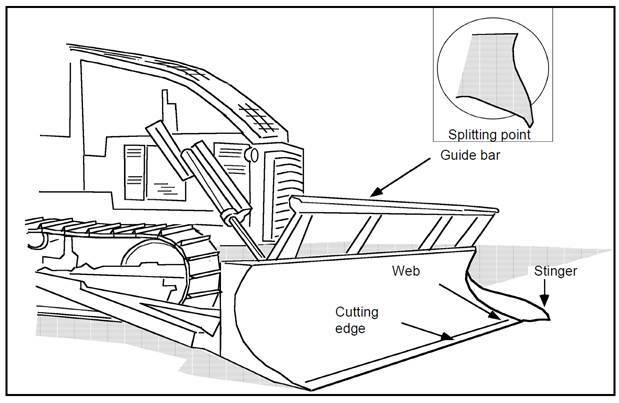 Tilt the dozer blade to cut shallow V-ditches (Figure 1-10). For larger ditches, push the material perpendicular to the center line of the ditch. After reaching the desired depth, push the material the length of the ditch to smooth the sides and bottom. Many times it is necessary to correct irregularities in a ditch. Attempt to remove humps or fill holes in a single pass. Use multiple passes to correct the grade. Step 1. Push the material from the beginning of the excavation to the stockpile area on the first pass. This distance should be no more than 75 feet from the start point. Do not excavate deeper than 6 to 8 inches, while maintaining a smooth cut. no one will be endangered. Step 2. Begin to raise the blade one dozer length from the stockpile, letting the material drift under the blade forming a ramp upon reaching the stockpile area. necessary before starting down the grade. Do not change gears while going downhill. Step 3. Push the material on successive cuts in the same manner, working the dozer from the start point all the way around the work area while stockpiling. Overlap cuts about one-third of the blade’s width to pick up windrows. NOTE: Do not stop the forward motion or cause the tracks to spin while pushing material. Step 4. Make successive cuts the same as in step 2, constructing the stockpile higher on each pass until it reaches the desired height. Step 1. Lower the blade to the desired height while moving forward. Step 2. Adjust the blade height and move the dozer into the side of the pile making the cut with only one-third of the blade. NOTE: When using the left side of the blade, continue working to the left. When using the right side of the blade, continue working to the right. Step 3. Cut into the stockpile. The blade should be as full as possible without stalling the dozer or spinning the tracks. Raise and lower the blade to maintain a smooth pass. the danger from collapsing material. Step 4. Spread the blade load after cutting the pile by continuing to move forward and slowly raising the blade until all material is evenly feathered. Step 5. Feather the blade load and reverse the dozer. Raise the blade about 12 inches off the ground, back the dozer to the stockpile, and reposition for another cut. Repeat the above steps until the stockpile has been leveled and spread over the designated area. Do not back blade to level the stockpile. Backfilling can be effectively accomplished by drifting material sideways with an angle blade. This allows forward motion parallel to the excavation. With a straight blade, approach the excavation at a slight angle and then, at the end of the pass, turn in toward the excavation. No part of the tracks should hang over the edge. Adjust the length of the push based on soil conditions. For example, when working in soft material or on an unstable slope, let the second bladeful push the first bladeful over the edge. Be careful to keep oversize materials out of the backfill. Step 1. Position the dozer on the uphill side if operating on a slope, about half the length of the dozer from the start of the area to be ripped. Step 2. Place the transmission shift lever in forward, first gear. Step 3. Lower the rippers to the ripping depth as the dozer begins to cross the area to be ripped. Step 4. Raise the rippers out of the ground and then stop at the end of the pass. Step 5. Place the transmission in reverse and back the dozer to the start point. Step 6. Position the dozer to overlap the previous ripping pass. Repeat steps 1 through 6 until the area is completely ripped. Three-shank ripping works well in these materials. Use as many shanks as possible to break material to the desired size. Use two shanks for ripping where rocks break out in small pieces and the machine can handle the job easily. Use only the center shank if the machine begins to stall or the tracks spin. • Asphalt. Raise the ripper shank to lift out and break the material. • Concrete. Use one-shank ripping to sever reinforcing rods or wire mesh effectively. Use one shank in hard-to-rip material or material that tends to break out in large slabs or pieces. Winching is hoisting or hauling with a winch, using a cable. When winching, make sure personnel are clear of the cable. Cables can break and cause severe injury. Exercise caution with suspended loads. If the engine revolutions (speed) are too low, the weight of the load may exceed the engine capacity causing the load to drop, even though the winch is in the reel-in position. the engine before moving the winch control lever. Do not operate the winch for extended durations. • A 60-minute working hour (100 percent efficiency). • Power-shift machines with 0.05-minute fixed times are being used. 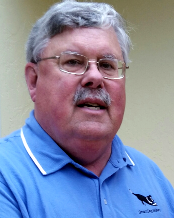 • The dozer cuts 50 feet, then drifts the blade load to dump over a high wall. • The soil density is 2,300 pounds per LCY. • The coefficient of traction equals 0.5 or better for crawler machines and 0.4 or better for wheel machines. • Hydraulic-controlled blades are being used. Step 1. Determine the maximum production. Determine the estimated maximum production from either Figure2- 13 or 2-14, based on the type of dozer being used. Find the dozing distance on the bottom horizontal scale in the proper figure. Read up vertically until intersecting the production curve for the dozer being considered then read the vertical scale on the left to determine the maximum production in LCY per hour. • Use Figure 2-13 to determine the estimated maximum production for D3 through D6 tractors with straight blades. The DEUCE has the same production capability as the D5. • Use Figure 2-14 to determine the estimated maximum production for D7 or D8 tractors with universal or straight blades. Step 2. Determine the grade correction factor—(-) favorable or (+) unfavorable. Find the percent grade on the top horizontal scale of Figure 2-15. Read down vertically and intersect the grade correction curve, then read to the right horizontally and locate the grade correction factor on the vertical scale. Step 3. Determine the material-weight correction factor. If the actual unit weight of the material to be pushed is not available from soil investigations, use the average values found in Table 1-3 Material Weight , Swell Percentages and Load Factors.. Divide 2,300 pounds per LCY by the material’s LCY weight to find the correction factor. Soil density of 2,300 pounds per LCY is a constant that was assumed in determining the maximum production. Step 4. Determine the material-type correction factor. Dozer blades are designed to cut material and give it a rolling effect in front of the blade. This results in a production factor of 1. Table 2-4 gives the correction factors to account for how different materials behave in front of the blade. Step 5. Determine the operator correction factor (see Table 2-2). Step 6. Determine the operating-technique correction factor from Table 2-5. Step 7. Determine the efficiency facto using EQ 1-3. In the case of a well-managed job, expect 50 minutes of production time per hour. Step 8. Determine dozer production. Step 9. Determine the material conversion factor, if required. To find the total time (step 10) and the total number of dozers required to complete a mission within a given time (step 11), adjust the volume of material that is being moved and the equipment production rate per hour so that they both represent the same material state. Refer to material and production states as LCY, BCY, and CCY. If necessary to convert, use Table 1-1, page 1-4, to find the material conversion factor. Multiply the conversion factor by the production per hour to find the production per hour in a different state. NOTE: This conversion will not change the dozer production effort. Determine the average hourly production (in CCY) of a straight-blade D7 (with tilt cylinder) moving hard-packed clay an average distance of 200 feet, down a 10 percent grade, using slot dozing. Estimated material weight is 2,500 pounds per LCY. The operator is of average ability and will work during daylight hours. Expected efficiency is 50 minutes per hour. Step 10. Determine the total time required in hours. Determine the total time required to move 3,000 CCY of hard-packed clay, using one D7 dozer with a production rate of 120 CCY per hour. Determine how many D7 dozers (with a production rate of 120 CCY per hour) would be needed to move 3,000 CCY of clay in seven hours. The best method to estimate ripping production is by working a test section and recording the time required and the production achieved. However, the opportunity to conduct such investigations is often nonexistent and, therefore, estimates are usually based on historical production charts. Ripping applications will increase the machine’s maintenance requirements by 30 to 40 percent. A quick method to determine an approximate production rate is to time several passes of a ripper over a measured distance. The timed duration should include the turnaround time at the end of the pass. Determine an average cycle time from the timed cycles. Determine the quantity (volume) from the measured length multiplied by the width of the ripped area and the depth of penetration. If measurements are in feet, divide the number of feet by 27 to convert cubic feet to cubic yards. method is about 20 percent higher than an accurately cross-sectioned study. • The efficiency factor is 100 percent (60-minute working hour). • The power-shift machines used have single-shank rippers. • The machine rips full-time, no dozing. • The upper limit of the band reflects ripping under ideal conditions only. If conditions such as thick laminations, vertical laminations, or other rock structural conditions exist which would adversely affect production, use the lower limit. mudstone, clay stone, and fine-grained caliches. Determine how many 300-horsepower dozers are needed to rip 9,000 BCY of limestone having a seismic velocity of 4,000 feet per second in 7 hours. The limestone is bedded in thin laminated layers. Efficiency will be a 45-minute working hour. Maximum production for ideal conditions (thin layers) is 1,700 BCY per hour (Figure 17). • Never carry personnel on the tractor drawbar. • Never turn around on steep slopes; back up or down instead. • Keep the machine in low gear when towing a heavy load downhill. • Always lower the blades when the machine is parked. • Ensure that only one person is on the machine while it is in operation. However, in some training situations it is necessary to have two people on a dozer while it is in operation.